Tire size ? ....smaller fronts that rear? Re: Tire size ? ....smaller fronts that rear? Pretty darn cool! 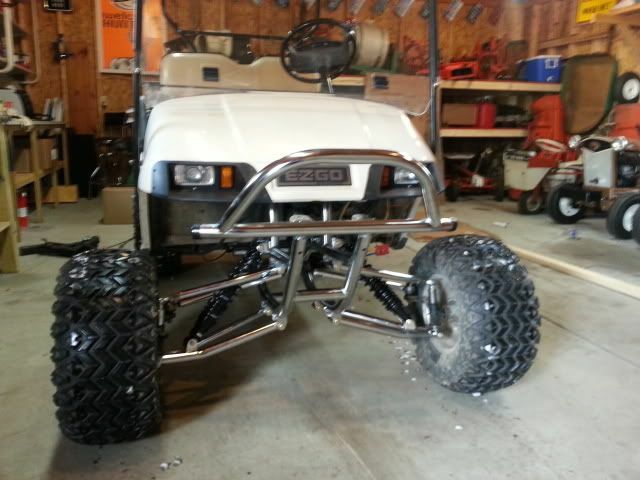 Im not sure how well it would handle the mud however. I may have to search for threads on that beast....what kind of powerplant is in there? On thing I have always done is run 12-15psi in the rears (and sometimes I haul weight in the box) and run 6-8psi in the front tires. That helps it turn much better. 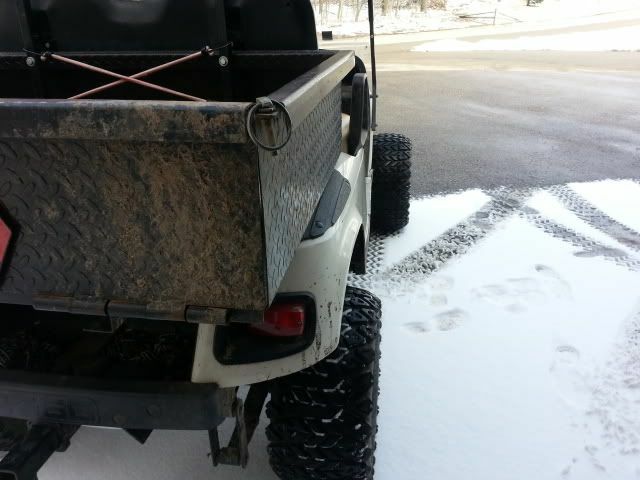 Run a lot of wooded trails and it turns really well that way, sometimes the rear will slide around. Only time the front slides is when I gas it hard at low speeds. I can't do a donut if the rear bites it goes straight. If it spins it will do a donut no problem (like on gravel/etc, with the clone engine of course). Well, I got a real good inaugural run in last nite with the 23 Vanny and Stretch LT. Some road riding (pulling 30mph with the 22's and 28deg secondary, plan to return to stock this week) and some off road fun at a closed down campground near the house. Wow! She sure spins them...spins them on dry pavement with 3 people in the seat! It is a different animal in the snow now, but I still cannot control my direction...I find myself 'steering' by throwing a roost and bringing the rear end around. Did get stuck in the snow once...the AT's just can't get a grip. After feeling all that torque, I'm thinking I may bump up my intended tire size to gain a bit more mph on top. I'm sure it will still spin 26" ers with ease. I'll probably have to stick with the same size front to rear...just no feasible options out there that I'm seeing. and a 20 in the rear, since I have an 83 club car with original 36 volt system. I'm looking at a tire upgrade (currently 22x11-10), and am running into a few roadblocks. In an effort to use the 10x8 rims I currently have, and minimize the expense of new shoes, I was wondering if folks ever run a small diameter front tire, than rear, of the same model? 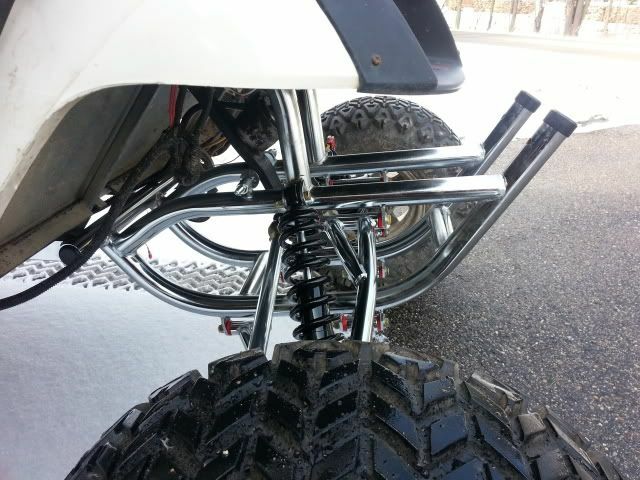 Seems ATV's often do the opposite...use a smaller rear than front, assuming that the larger front reduces rolling resistance and aids in controlling the machine, while the rear is kept to a diameter that maximizes torque. Ideally, I would like to run a narrower front tire (8-9.5"), while sticking with a 10-12" wide rear. My 11" fronts are simply too wide, and like to skate around on mud, and are totally useless in snow, both of which I typically see a lot of. When looking at aggressive treads that fit my rim, in the 24-26" tire family, I'm not seeing many multiple width options, but do, if I expand my search to include a smaller diameter front tire than rear. Any experience or opinions to share? I know the Vanny will be more than fine running something as large as a 25 or 26" tire, and that will help my top end as well, but I'm not seeing much in the way of narrower options until I get down to a 24" tire. 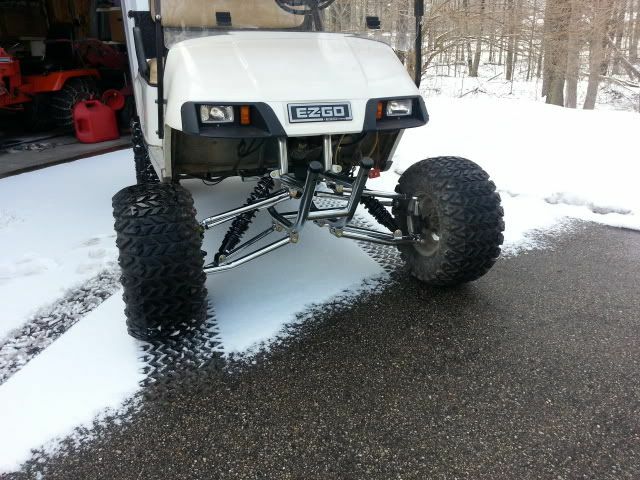 The new Stretch front end can/will sit higher than my current 5", bringing the nose up a bit, so putting my spindles a half inch closer to the ground up front would help level the cart. I have no intentions of modifying the rear, except for looking into an automotive shock via the Monroe charts available here to help the ride. 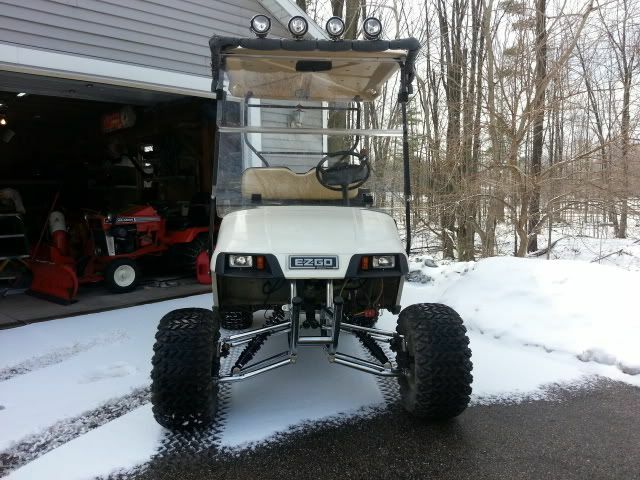 Club car with 6in. Lift. 22x10 on back. Changed fronts to 20x9 handles way better.looks fine.